and construction supervisors operating throughout Czech Republic. We are not just architects. We are masters of design and realisation of modern buildings. We will guide you through building proccess from finding the perfect land till final handover. 9 stages for designing and building your perfect home. 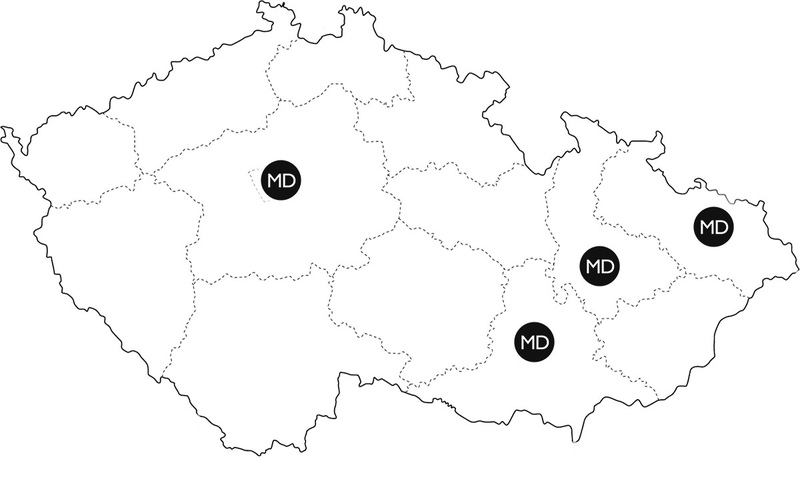 We have offices throughout Czech Republic. are built or currently under constuction. Our power is in close team cooperation. Whenever one of our architects reaches his limits in terms of creativity, our team would intervene to achieve the best results. Thanks to our team effort, we are able to recognize the perfect combination between your dreams, needs and budget. The shape of elevating quadrant is defined by corner plot with specific slope. Natural design of this luxury house is completed with wooden and stone facades. Funkcionalist villa with three terraces in Nový Jičín. Feng Shui house in Všestary u Říčan. Upper floor of this house creates cover for terraces and shading for living room and provides amazing views of mountains and countryside. These two bungalows are connected with entrance space into one Object. Designed with large terrace with wooden roof, this family house is ideal place for relaxing outside at the garden. Luxury house with green roof and solar roof tiles in Dobřejovice. Steep plot surrounded by forest defined natural house with green roof, atrium and wooden parts. Compact white house with central atrium Hajany. House with terraces trilobit Vysoký Újezd u Berouna.